Stage performers can't go up on that stage wearing a business suit. You need a suit that is flashy. Like a Red Suit. A suit that literally captured the spotlight with you in it. A Purple Suit can certainly make that happen. That is why you need a collection of mens suits for stage performers. You'll find that these type of mens suits are all about getting seen the moment you get on stage and enter that spotlight to start your show. The complete opposite of the Pinstripe suit. Entertaining is no easy feat and you're on that stage to make sure that your audience leaves with smiles on their faces. Mens suits for stage performers will help that happen because your audience can spend their time focusing on you and your craft. 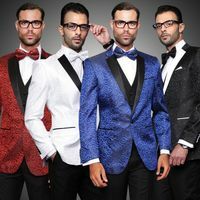 You'll find that these flashy entertainer suits for stage performers feature shiny and bright color fabric that you would never see or wear to an office. You'll find shiny sharkskin fabric suits as well as sequin and glitter types of suits as well. When it comes to color, there is simply no color that you're not going to find at Contempo Suits. Pink, bright green, fuchsia and red. 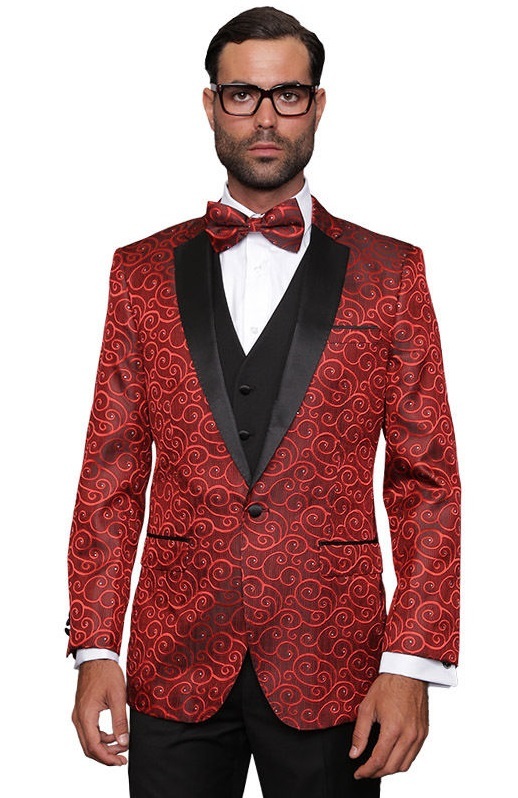 These are just a sample of the bright colorful suits for stage performers and entertainers you will find.